The purpose of the Church Triumphant is to make God's people aware of the awesome inheritance that awaits them in eternity. When Christ returns again He is coming for a Triumphant Church, a Church without spot or blemish. 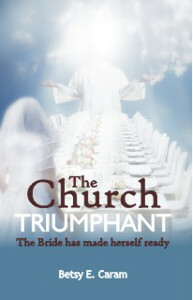 He is coming for a people who have not only been called to go to heaven, but also to become the bride of Christ. To be the Bride of Christ is a high and holy calling. However, there are qualifications that must be met. Revelation 19:17 tells us that the Bride must prepare herself: "Let us be glad and rejoice, and give Him glory, for the marriage of the Lamb has come, and his wife has made herself ready." Betsy Caram is an author and pastor's wife who travels extensively with her husband, Dr. Paul G. Caram. She has also authored another book called "Women of Influence and Distinction."